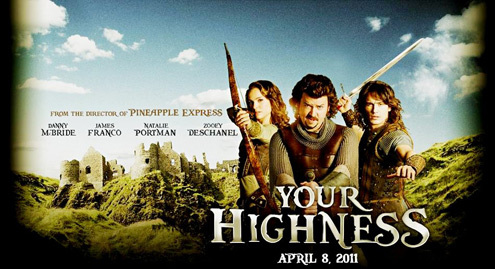 Your Highness is an Action Adventure film released in 2011 and subject to much hybridisation – as a hybrid it its own right (action and adventure) it also is a comedy and borrows from the conventions of the fantasy genre. Using key features from four mainstream, commercially successful genres maximised the chances of success for the film along with star marketing, high production values and wide distribution by Universal Studios. Action, Adventure, Comedy and Fantasy films commonly attract younger, mass audiences reflecting the classic 12-18, C1, C2, D cinema going demographic. Your Highness would have a fairly balanced target audience in terms of gender (something for the boys, something for the girls) with perhaps a male gender skew due to the action and adventure sequences which are stereotypically consumed by this audience. Audience appeals would include the star marketing of James Franco and Natalie Portman, both good looking American lead actors and both framed for the male and female gaze. The light hearted nature of the comedy and innocent humour would engage younger audiences and parents while the narrative itself (always a journey or quest in action adventure films) would also be of interest in terms of narrative enigmas and ultimate closure – one of the appeals of big budget Hollywood films often is the classic three act structure.